The Lahore Canal is part of the heritage of Lahore and protected by the Lahore Canal Heritage Park Act, 2013. A meeting of the Advisory Committee of the Heritage Park has been called for 15 May 2014 with three items on the agenda. All three are infrastructure developments along the Canal. For more background read here and here. I am in receipt of the notice for the captioned Committee meeting called for 15 May 2014. Unfortunately, I have professional commitments outside Lahore on that date and will be unable to attend. Due to the serious nature of the agenda proposed for the meeting, I am submitting my written comments as against the agenda points so that they may be circulated amongst other Committee members and recorded as my opinion in the meeting of the Committee. 3) Widening of Canal Bank Road from Harbanspura to Jallo. You will recall that 3rd meeting of the Committee held on 24 October 2013 was convened specifically to consider some TEPA proposals for infrastructure development along the Lahore Canal. I had taken strong exception to the TEPA proposals and had also pointed out that further meetings of the Committee without properly framed rules of procedure would be improper. 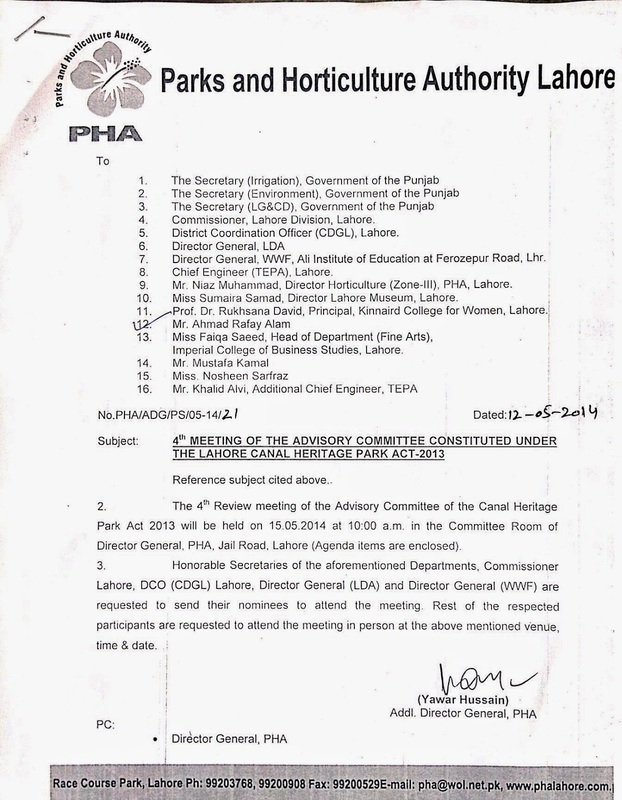 A draft of the “Lahore Canal Heritage Park (Meetings of Advisory Committee) Rules, 2013” has been submitted to the Committee and the minutes of the 3rd meeting clearly record the decision of the Committee “that these draft rules must be submitted for approval of the Competent Authority within a week’s time” (emphasis added). It has been several months since and the Committee has not been informed whether such approval has been obtained and I therefore operate under the assumption that no such approval has been sought or granted. I again reiterate that, regardless of the subject matter to be discussed by the Committee, the proper way to proceed would be to have these rules notified so that the Committee’s meetings are in accordance with law. Convening a meeting of the Committee to discuss infrastructure projects that have serious financial and long-term urban planning repercussions is, in the circumstances, a seriously irregularity that may affect the legal validity of any Committee decision or action. And to convene a meeting of the Committee without properly establishing rules of procedure or without having first properly demarcating and notifying the Lahore Canal Heritage Park, invites suspicion of a desire on the part of some elements to forcibly have infrastructure developments along the Lahore Canal approved without due process. I will therefore once again request you, as I have before, to submit the draft rules for approval to the competent authority and, only once approved, convene a meeting of the Committee. In any event, with regards the agenda items, may I bring to your notice that construction and infrastructure development work have been prohibited with regards the Lahore Canal Heritage Park. 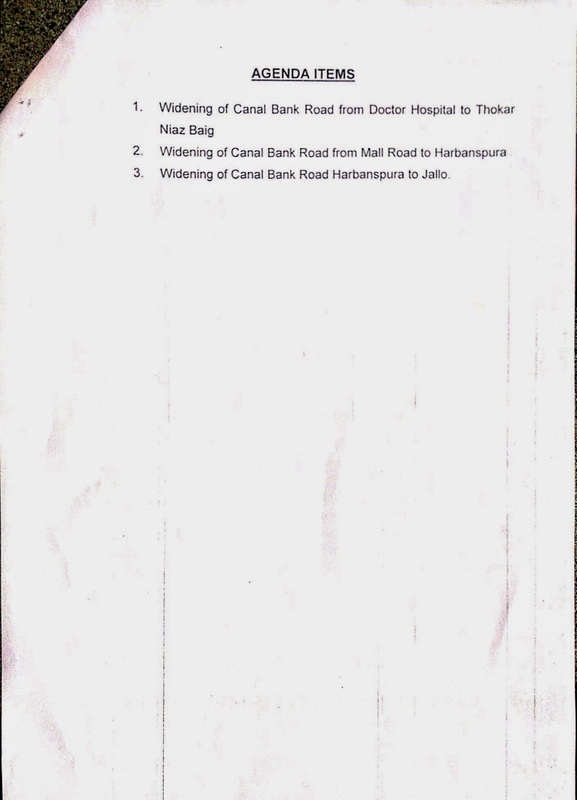 At the outset, therefore, the agenda items are activities that are prohibited under Section 3(5) of the Lahore Canal Heritage Park Act, 2013 (the “Act”). I will also point out that under the Act, if TEPA is desirous of undertaking infrastructure projects that affect the Heritage Park, it must seek the permission of the Parks and Horticulture Authority (the “PHA”). Section 5(8) of the Act sets out the various considerations TEPA must respond to if it seeks such permission. And I note the notice and agenda of the 4th meeting of the Committee do not carry any of the information that is legally required for TEPA to be eligible to make such a request for permission. If you nevertheless choose to convene the 4th meeting and table the agenda items as proposed, I will further submit that the infrastructure developments proposed by TEPA are unsound on several levels. The history of the Committee and of the Act is a landmark achievement of law, urban development and civil society. The Act is a result of a direction of the Supreme Court of Pakistan to declare the green belt along the Lahore Canal a heritage park. Even the preamble of the Act declares the green belts on both sides of the canal a public trust and part of the heritage of the city of Lahore and states that its purpose is the conservation of the Lahore Canal as a heritage park. Therefore, to expect the Committee, which was established in the light of this history and with a special mandate to protect the heritage of Lahore, to consider and approve the destruction of that heritage is too much to ask. The powers and functions of the Committee are, inter alia, to prepare and administer the Heritage Park. But since the Committee’s notification, no effort has been made to follow the directions of the Committee with regards to demarcation of boundary of the Heritage Park and, as discussed above, notify rules of procedure. The work of the Committee has not yet started in earnest yet it seems it is now being asked to give approval for infrastructure developments that it does not have the power or function to approve and which are, in any event, the very antithesis of its being. The infrastructure developments proposed by TEPA and to be considered on the agenda are, at best, ad hoc solutions to the traffic problems of Lahore. Whilst it has spent billions on infrastructure development along the Canal in the previous decade – haphazard development that resulted in a suo motu action and eventually the passage of the Act – the city still lacks a transport master plan. To expect the Committee to decide on hundreds of millions of Rupees of further infrastructure developments in the absence of a proper master plan and in the face of repeated failures of existing infrastructure to “resolve” traffic congestion is severely misplaced. The Committee has no evidence to suggest that the proposed traffic infrastructure developments will respond to traffic challenges in the city as none of the previous examples of infrastructure development can be shown to be successful. Meanwhile, the Act declares the Lahore Canal a heritage park. How can the Committee be expected to sacrifice the heritage of Lahore to such ad hoc and short-term proposals? The world over new urban planning practices stress on the need for traffic management, yet the TEPA has not shown any inking of initiative in this area. Instead, it has proposed the violation of public trust and destruction of heritage. TEPA should instead be instructed by the Committee to return to the drafting board, so to speak, and reconsider its approach to transport issues in Lahore in a manner that is holistic, sustainable, environmentally friendly, equitable and democratic. Under the Act, the Committee does have the power to advise the PHA on any matter ancillary to the discharge of its functions under the Act. It is my belief – and this is the civil society representation I bring to the membership of the Committee – that the Heritage Park cannot be sacrificed in the manner proposed by TEPA and I therefore propose that the Committee resolve to advise the PHA to consider, in addition to the strict requirements of the Act, the history, nature and role of the Lahore Canal as part of the heritage of Lahore before allowing any permission for infrastructure projects to be carried out on it. The Canal is the heritage of Lahore and needs to be developed so that future generations of Lahoris can also experience the joy and calm it brings to the residents and visitors to the city – a joy and calm they share with one another; a shared memory map that connects Lahoris to their city, to their past and to their culture. And this cultural heritage should be protected and promoted by the Committee. Any city gets what it admires and what it pays for and ultimately deserves. And we will probably be judged not for the monuments we build but the monuments we destroy. Once again, my friend Adam Sulkowski asked a question that forced me to stretch deep into my memory for a quote. Adam asked how one is to judge the morality of historical figures. Do we condone their brutality "'cause they rolled that way" or do we apply modern standards to their actions. Well, anyway, I was reminded of something I wrote for TFT back in 2005. Lawyers with extra time on their hands are often advised to keep their teeth sharp by researching the law. Such research often reveals the ebbs and flows in the development of the law, conferring upon such diligent students a full appreciation of its niceties. On the other hand, a disadvantage of such a course of action is that, tired by hours of examining legal texts, lawyers begin to see everything in terms of the law. In such circumstances myself, I often find it an amusing distraction to apply legal principles to quotidian activities. Even more amusing is applying legal principles and techniques to historical and literary sources. And where better to begin that the earliest recorded murder trial. The facts of the case are simple: Cain and Abel were brothers; Cain was an agriculturalist and Abel a herdsman. At a certain time each of them brought an offering onto the Lord; Cain’s offering consisted of the fruits of the ground and Abel’s offering of the firstlings of his flock and the fat thereof. For some unexplained reason, the Lord accepted the offering of Abel and turned from the offering of Cain. And Cain was very wroth and his countenance fell, so to speak. His anger appears to have turned him against his brother, and although the Lord warned him against yielding to such base instincts, he bided his time and “it came to pass when they were in the field that Cain rose up against Abel his brother and slew him.” This is the record of the case in all its simplicity. The only witness to the crime was the blood of the murdered Abel, which, according to the record, had a voice which cried out for vengeance and was heard by God, who appeared for the purposes of conducting the investigation and the trial. Now, the only known facts at the time were than Cain and Abel were seen going out to the field together and that Cain returned alone and without any trace of his brother save for the blood stains on the field. Naturally, suspicion fell on Cain. The Lord summoned Cain to appear before him and immediately subjected him to one of those short, sharp cross-examination questions which win the admiration of people: “Where is thy brother Abel?” Unlike Adam, who confessed immediately to the charge of eating from the forbidden tree, Abel averted the question with a “I know not. Am I my brother’s keeper?” Such a defiant and heartless answer appears to have strengthened the suspicion against him. To make matters worse, Cain slipped into sarcasm, adding a “Is it my duty to look after him as he looks after his sheep?” For reasons untold (my hunch is overconfidence), Cain made no further attempt to defend himself – no doubt relying on the fact that no other witnesses could be produced against him. However, Cain’s confidence was misplaced. The next question put to him blew him away: “What hast thou done? The voice of thy brother’s blood crieth onto me from the ground.” Cain had forgotten that his brother’s blood was the star witness against him. And the voice was enough evidence enough to convict. Cain’s fear of being put to death must no doubt been assuaged when the sentence against him was pronounced in these words: “And now art thou cursed from the earth, which has opened her mouth to receive thy brother’s blood from thy hand.” Thus Cain went from the presence of the Lord and dwelt in the land of Nod, east of Eden. However, the punishment of exile is interesting as, at the time the statute governing homicide was Genesis IX, 6: “Whoso sheddeth a man’s blood, by man should be his blood shed.” No grounds for mitigation can be found, nor any reason deduced as to why Cain was exempted from capital punishment. Any lawyer worth his salt can tell you Cain’s conviction would be overturned on appeal for the simple ground that the Almighty had been judge, jury and executioner all rolled into one. In other words, the trial would fail the tests of Natural Justice. One needn’t even dwell on the reality of talking blood. However amusing it may be to spend one’s time in such frivolities, research of the law also makes clear to students of it that things accepted in times past would not turn the colour of modern legal litmus paper. For example, the U.S. state of Georgia had deemed it an offence in 1909 for any person to be “guilty of open lewdness, or any notorious act of public indecency, tending to debauch the moral.” An interesting case was put before the Supreme Court of Georgia when a criminal court convicted two men for taking “a bull to a cow in heat in a pasture adjoining a highway on which there was a woman and several children” (Redd v. State, 67 S.E. 709). On appeal, it was argued on behalf of the convicted men that, according to the law, “the patriarch Jacob standing at the public watering place and holding the striped rods before Laban’s bulls, rams, and he-goats when they leaped, in order that the young be marked with stripes, would have been guilty of public indecency.” A clever argument, but one which did not find favor in the court of one Powell, J. The court observed: “Perhaps so. But, as able counsel for the state has replied, it will not do to measure modern morals according to the standards of ancient and biblical times. King Soloman with his thousand wives would not be tolerated in Georgia; and King David, he the man after God’s own heart, could hardly justify his whole life according to the provisions of the Penal Code of this state.” I only wish some of our more fervent clerics can take notice of the implication of such words. Strangely, I am not alone in going out of my way to distract myself. In Europe, the legal profession has seen to it that Victorian literature be put through legal analysis. One of the most hotly debated literary decisions is the trial scene in William Shakespeare’s The Merchant of Venice. Here, the usurer Shylock sued for breach of agreement. However, according to the terms of the contract, Shylock – a foreigner in Venice – was due damages in the form of one pound of the Venetian citizen Antonio’s flesh. The case was presided over by Portia, a young Magistrate but one who was, according to Shylock, “much more elder . . . than thy looks.” During the trial, the contract, its terms as well the factum of its breach were admitted. As the contract stipulated that the flesh would be extracted from a place “Nearest his heart,” Antonio was ordered to bare his breast. But before Shylock could become accomplice to what would most certainly have been judicially sponsored murder, Portia stepped in to remind him of an archaic Venetian statute prohibiting grievous bodily harm. According to that law, anyone guilty of shedding “One drop of Christian blood” was liable to have all his lands and goods confiscated by the state. And before Shylock could recover from the shock of this revelation, Portia informed him further than: “The law hath another hold on you/ It is enacted in the laws of Venice/ If it be proved against any alien/ That by direct or indirect attempts/ He seek the life of any citizen/ The party against which he doth contrive/ Shall seize one half his goods; the other half/ Comes to the privy coffer of the state/ And the offender’s life lies in the mercy/ Of the duke only . . .” Shylock had succeeded only in snatching defeat from the jaws of victory. To do a great right, do a little wrong . . .
Another one from the old TFT Miscellany-at-Law days. Readers will no doubt agree that judges have difficult jobs. When they are not busy dealing with phone calls from frantic Law Ministers, they are elbow deep in listening to arguments or writing judgments. It will also be self evident that each case, however different from another, must present before the judge the same dilemma: Whether to exercise their judicial discretion and grant justice, or to remain in harmony with the precedents set out in previously decided cases. Both choices are fraught with difficulty. I am a Portia man.” It seems Justice Shah either sided purely with Bassanio’s camp, or had not read the scene completely. Because he wabbled when he walked. But this calf lyrical should not cloud our judgment. Discretion, the opposite of following precedent, is sometimes a poor substitute for principle, however great the judge. “The Discretion of a judge is the Law of Tyrants; it is always unknown; it is different in different Men; it is casual and depends Constitution, Temper, and Passion. In the best it is often times Caprice, in the worst it is every Vice, Folly, and Passion to which human Nature is liable.”(as cited by Perrin J. in Conway and Lynch v. R. (1845) 7 Ir.L.R 149). Such a warning is to be taken seriously. Where, then, are our judges left? Between the rock of precedent and the hard place of discretion? The difficult quest for justice may be summed up by the words attributed to Bowen L.J., when, in determining a case, he remarked: “When I hear of ‘equity’ in a case like this, I am reminded of a blind man – in a dark room – looking for a black hat – which isn’t there!” Perhaps a solution is to be found in the ingenuity of the Bench itself; in a dose of common sense. In 1893 it fell to be decided whether a launch in an artificial lake half a mile long was a “ship” within the English Merchant Shipping Act, 1854. Lord Coleridge C.J. addressed the point with great clarity: “The Attorney-General has asked where we are to draw the line. The answer is that is not necessary to draw the line at any precise point. It is enough for us to say that the present case is on the right side of any reasonable line that could be drawn” (Mayor &c. of Southport v. Morriss  I QB 359). How true! This article was written over a decade ago, during the Benazir Bhutto’s appeal against her conviction by an Accountability Court. Then, the Court convicting her was accused of bias. I wrote this article - part of a series of columns for TFT on the miscellany of law - reflecting on some aspects of bias. Recently, the Supreme Court has been criticised for being biased again. The Mohtarma Benazir Bhutto is launching another attempt to enter Pakistan triumphantly, bringing allegations of bias against the judiciary with her. Her lawyers who, at this moment, are prevaricating and delaying in our august Supreme Court, seek to introduce into evidence, amongst other things, alleged phone conversations recorded by (what our press likes to call) the ‘sensitive’ agencies. Sensitive or not, these intelligence agencies seem to have tapped the phones of the judges hearing Ms. Bhutto’s case in 1999. More interesting is the alleged phone conversation between the then Law Minister, Khalid Anwar, and the High Court Judge Malik Mohammad Qayoom. Less interesting is Khalid Anwar’s tepid defense of his actions (published in the daily DAWN). One of the rules of ‘Natural Justice’ is that everyone is entitled to be heard by a judge who is not biased or prejudiced in a way that precludes a fair and genuine trial. This rule of Natural Justice was first set out by Lord Hewart CJ in what is now a familiar phrase: “Justice should not only be done, but should manifestly and undoubtedly be seen to be done” (R v. Sussex JJ., ex parte McCarthy  1 KB 256). Of course, judges are only human, and it impossible to expect from them “the icy impartiality of a Rhadamanthus”, the cruel judge of Hell, who punished before he heard (cited by Bowen LJ in Jackson v. Barry Ry. 1 Ch 238). Evidently, even Satan is unfamiliar with that other rule of Natural Justice, the audi alterem partem principle that no one should be condemned unheard. But I digress. Judges are not supermen, an astute observation made by our Supreme Court (for more on that particular farce, read Justice Akhlaq Hussain’s case PLD 1969 SC 201). They are men, and hence liable to their individual temper, constitution and passion; which is why if and when these three emotions are exercised, a litigant is entitled to a new, unbiased trail. The tests for bias are settled principles of law, but their development has thrown up the odd case or two of some interest. Take, for example, R. (Donoghue) v. Cork County JJ. ( 2 IR 271) where the conviction by an Irish magistrate – and it is important to remember the Magistrate was Irish – of a certain defendant was quashed when it was shown that “a very bad feeling” existed between him and the defendant’s family. DeSmith’s does not elaborate on the case, and reveals only that the animosity was the result of “a trespass by a fowl.” Ghar ki murghi = conviction, I suppose. The natural right of every litigant to have a fair trial is so fundamental to the practice of the law that even the most absurd allegations of bias have been adjudicated upon. In R v. Dublin JJ. ( 2 IR 75), the owners of a public house whose liquor license had not been granted by the licensing judge (in England, establishments that serve liquor must have permission to do so) brought a case of bias against him on the grounds that he was a teetotaler. Their argument was that the licensing judge’s state of mind was “likely to prevent him from dealing fairly with applications before him”. The challenge, however, was unsuccessful. Of course, the act of trying to bias a judge is a different story altogether. An Indian case, reported as 45 Cr LJ 244 (RC) is quite succinct on the issue: Here, interference by a minister in a trial case was proved. It was decided that the case was to be retried because of this alleged interference, even though it had not been proved whether or not it had been a cause of the verdict. Of course, all this case puts Mr. Khalid Anwar’s rather tepid defense of his action in serious doubt, regardless of what Ardeshir Cowasjee or Amina Jilani may say. For the prosecution, on the other hand, the issues raised by these tapes are different. To them it seems that the introduction of the tapes into evidence is only a means to divert attention from the fact that Ms. Bhutto and her husband are guilty of corruption. Their argument before the Supreme Court will attempt to bar the admission of the tapes into evidence on the grounds that the phone tappings were obtained unlawfully. In the United States, for example, the Supreme Court has held that under the Constitution a conviction obtained on evidence disclosed an unlawful search (which include phone tappings) cannot stand. The zeal of the prosecution team can be understood. For them, the threat is that Ms. Bhutto and her husband will be acquitted on a technicality. The American Supreme Court judge Benjamin Cardozo once expressed a similar view on the American law in People v. Defore (242 NY 13), describing it as one by which “the criminal is to go free because the constable has blundered.” But one wonders if the prosecution’s zeal has not clouded their better judgment: A convict is still entitled to a fair trial. Denying Benaizir this right can set an awful precedent. The rule of law cannot be denied, for even the devil is entitled to a fair trial. Robert Bolt’s play, “A Man for All Seasons”, sets out an eloquent defense of the rule of law. Henry VIII’s former Chancellor, Sir Thomas More, refused to take an oath “renouncing all obedience to the Bishop of Rome” and acknowledging the King as head of the Church of England. Of course, he was tried for treason (the analogies with Pakistan are so glaringly obvious that one need not dwell on them). MARGRET (speaking of Rich): Father, that man’s bad. ROPER: There is! Gods law! ALICE (exasperated, and as is pointing to Rich): While you talk, he’s gone! MORE (roused and excited): Oh? (Advances on Roper.) And when the last law was down, and the Devil turned round on you – where would you hide, Roper, the laws all being flat? (Leaves him.) This country’s planted thick with laws from coast to coast – Man’s law, not God’s – and if you cut them down – and you’re just the man to do it – d’you really think you could stand upright in the winds that would blow then? (Quietly.) Yes, I’d give the Devil benefit of law, for my own safety’s sake. It’s a pity, then, that More’ faith in the law did not work out. He was condemned to a traitor’s death, but ‘mercifully’ this was commuted to just execution. Of course, Benazir’s case is not one of life imitating art, and so Thomas More (and his gory fate) cannot be used as arguments. Our Supreme Court should give Ms. Bhutto the fair trail she deserves, and ensure that the rule of law is protected and preserved. Father, environment activist, lawyer, academic and cyclist.